Beaducation: The Blog: Make your own photo prop...or "I need flowers, STAT!" Make your own photo prop...or "I need flowers, STAT!" Newsletters are always fun to create. It's precisely because "create" is the operative word. Since this newsletter focuses on ideas for Mother's Day, I wanted to style the pics to reflect a "Springy-I-love-you-Mom" kind of attitude. I wanted flowers in the shot, and had no time to get any. I did however have some cute flowered paper and a scrap of wrapping from Lisa's book delivery that had cute butterflies on it. 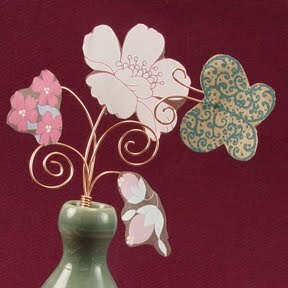 So I let the creativity flow...cut out some flowers and a butterfly from the wrapping paper and grabbed some 20 gauge copper wire. 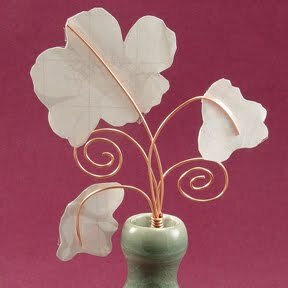 I cut a few random lengths of wire and used good old clear tape to affix the back of the flowers to the wire. (I burnished the tape really well over the wire, so the tape hardly shows) and then made a couple of spirals out of the other pieces of wire. The butterfly is suspended from a piece of fishing line and has wire antennae. I wrapped the flower bunch together securely with a short piece of wire coiled around the stems and voila! Instant photo prop!